Seems like all my beekeeping blogging buddies are posting for the new year, so I guess I’ll have to follow suit. I’m really feeling that we’ve turned the corner after the winter solstice and am excited for another new year of beekeeping. My first seed catalog arrived and I’m feeling the lengthening of the days. Getting bee related loot for Christmas surely helped. 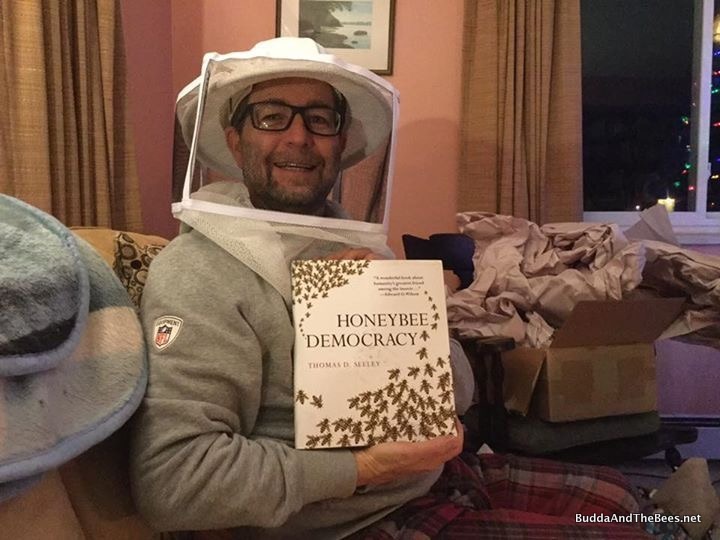 My wife came through with a new bee helmet/veil, a ventilated shirt, some cardboard nuc boxes for swarm trapping (and nucs of course) and Tom Seeley’s “Honeybee Democracy“. The nuc boxes are going to be great for swarm catching. I can keep them folded up in the cab of my truck and assemble them on site using top bars instead of frames. I got another “B” related item for Christmas to stoke my bacon fetish as well. One of the best Christmas presents was seeing the girls of BnB1 out flying on Christmas Eve. Maybe the insulation was helping! I didn’t see any signs of life from BnB2, though, but I hadn’t given up hope on them. Of course, true to form for Colorado weather, it snowed (briefly) on Christmas day, so the girls of BnB1 were hunkered back down again. As we headed towards the new year, we got another warm day on the 30th and this time, the girls of BnB2 headed out to enjoy the warm sun and carry out their dead sisters. So, going into the new year, the 2 backyard hives are alive. There’s still a long way to go until spring, but this is a hopeful sign. Here’s hoping that 2017 is good to you. 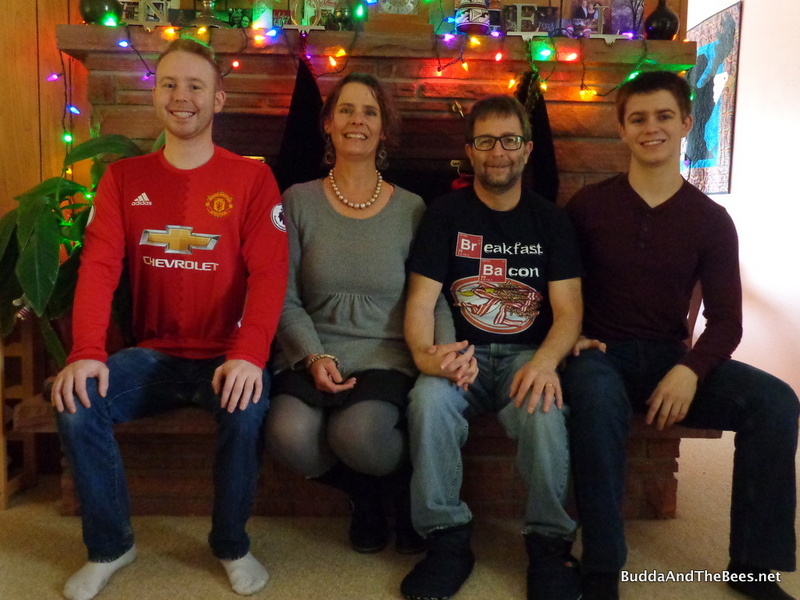 Happy New Year from Buddha And The Bees! You must have been a very good boy this year for Santa to bring you such great loot! 🙂 BTW, I thought of you when someone gave my husband a package of bacon they had smoked. 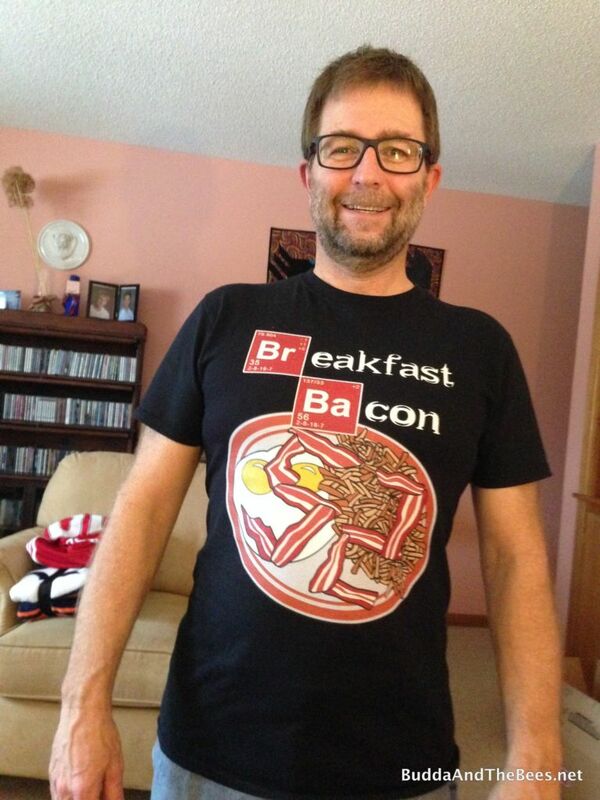 It would’ve gone great with your shirt. Glad that 2 of the colonies are alive and well. Fingers crossed for lots of splits! Happy New Year to you and the family! Thanks, Julie. I hope you have a great new year! Buddha and the Bees began as a response to our alarm about human activity’s impact on Bees and the larger environment. It has grown into ways to promote and create wellness through the tending of nature and the Bees, the study and teaching of yoga and the development of our body care products.